After more than 27 hours on the "road," Tracey Petervary approaches the finish line at last month's Arrowhead 135 in Minnesota. Tracey Petervary's breath was short and a cough was taking hold as she rode through the last checkpoint in the Arrowhead 135 in January. Temperatures had dipped to minus-30 during her fat (snow) bike race through lonely frozen swamps in Minnesota's North Woods. But now, 20 miles from the finish line, she sensed company. Armed with skills as a rider, an outdoorswoman and a mechanic, Tracey Petervary feels confident during her unpredictable rides. She spotted wolf tracks accompanied by a trail of blood-stained snow from a fresh kill. When she heard wheezing, her first thought was that it must be an unfortunate rabbit in the final throes of death. Then she realized the sound was coming from within. "The thought never crossed my mind to quit," said 41-year old Petervary. "I always know I'm going to be OK and I'm not going to die. I just don't have that fear." 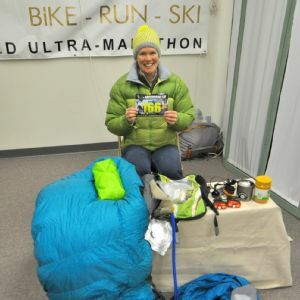 When she came across the finish line in fifth place overall and as the first woman, 27 hours and 22 minutes after she started, there was little fanfare. Her husband, Jay, who had come in first, was there, along with race officials and Mike "Kid" Riemer, the marketing manager for Salsa Cycles, one of her sponsors. "Those last 25 miles took about five hours, and that's a long time to be in a difficult state," said Riemer, who also has finished this race that annually has a 65 percent dropout rate. "Yet she didn't panic and stayed aware of her situation." Said her dad, simply: "So, you race men now." Petervary's preparation for the mostly male pursuit began at a young age. Growing up in New Jersey, she played basketball with the boys through grammar school before joining the freshman football team as an offensive lineman. Playing for the girls' basketball team in high school, she scored close to 1,000 points in her career. Upon marrying Jay, the pair got into traveling the world to participate in team adventure races, such as Eco-Challenge and Primal Quest. Fans of the various biking disciplines, they decided to focus on adventures in the saddle starting in 2002. Around the same time, they made the move from New Jersey to Jackson, Wyo., then across the border to Victor, Idaho. It was there that cycling morphed from hobby to lifestyle for the couple. It didn't take long for Petervary to establish herself as one of the best ultra-endurance bike racers in the country. Particularly at multiday, self-supported events, she is often one of the few women contending. It takes a different breed of person not to quit. Quitting is a brutal circle, and she just doesn't buy into it. "We pretty much ride and race all year round, from snow biking to road biking to mountain biking and cyclocross," she said. Even tandem bikes aren't off-limits for the Petervarys. In fact, in the summer of 2009, they were the first pair to ride the entire 2,745 miles from Banff, Alberta, to Antelope Wells, N.M., down the Great (Continental) Divide Mountain Bike Route on a tandem mountain bike. In 2012, she went back to complete the self-supported race on her own, pedaling up snow-covered Canadian passes, across the lush, green rolling landscapes of Montana and through the Grand Tetons. "The body is so amazing -- how much it can handle and what you can put it through," Petervary said. "There's something wonderful about the challenge, freedom, and simplicity of being able to eat, sleep, drink and ride." Although the mind has a way of glossing over the worst moments of competition, Jay, who holds the record for the Tour Divide race, said he never doubted Tracey would finish. "It was one of her more challenging races," he said. "She was out there in the middle of nowhere and having issues with retaining water and swelling in her legs. "It takes a different breed of person not to quit. Quitting is a brutal circle, and she just doesn't buy into it." 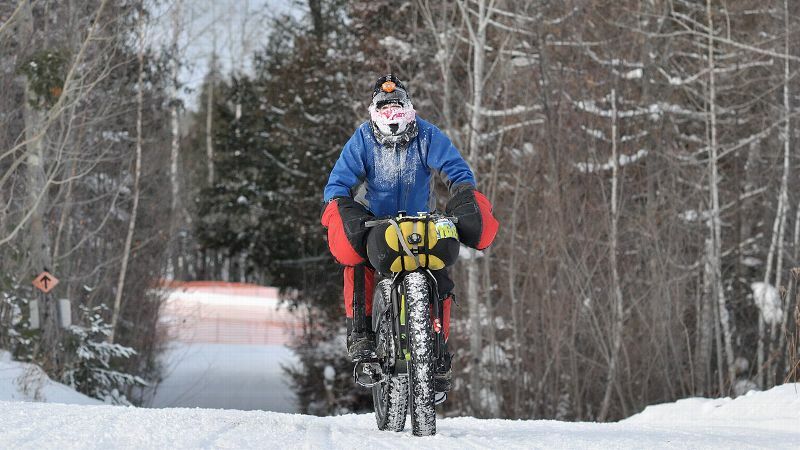 As if the Tour Divide weren't challenging enough, Tracey Petervary has also completed the 1,000-mile Iditarod Trail Invitational by fat bike several times. The race alternates between a northern and a southern route each year, and she owns the women's record for both. Building confidence has been perhaps more important than any fitness regimen Petervary could have adopted. Indeed, multiday, self-supported bike races are about patience, persistence and survival. "With this style of riding that we do, it isn't really a bike race," Jay said. "It's more about learning to be comfortable in the outdoors and knowing how to take care of yourself, be self-disciplined and aware." Tracey Petervary believes that women are better equipped than men to withstand the challenges of ultra-endurance biking. Although it was a steep learning curve for her in the beginning, Petervary has since gained the utmost confidence in her skill set. By possessing the knowledge of a rider, mechanic and outdoorswoman, she is free to focus on the path in front of her, rather than getting hung up on fear of the unknown. "If you're not confident, you have that self-doubt that'll lead you to quit," she said. "Knowing your gear and being confident that you know how to use it and if something breaks you're going to be OK -- these experiences have given me the opportunity to realize that I'm capable of whatever I put my mind to." It is this realization that makes Petervary hope that someday more women will enter these races and compete alongside her. "The women who do compete are often stronger than a lot of the men out there, especially when it comes to endurance; we have more body fat and can last longer," she said. "And mentally, women are often stronger -- think about it -- we are the ones who have the babies." A prolific racer, Petervary will kick off her late-winter/spring season with the Backyard Fat Pursuit 200K around Victor in the Greater Yellowstone Ecosystem on Saturday. With hundreds of miles of groomed snowmobile trails right outside their back door, it's the perfect setting for her to build on her Arrowhead 135 finish and perhaps seize the top spot. A week later she will ride the 35-mile Togwotee Winter Classic in the Jackson Hole valley, followed by a 400-mile mountain bike race through Southern California's mountains and deserts just a week after that. Then in May she'll tackle the 200-mile Dirty Kanza, a gravel grinder in the Flint Hills of Kansas. Despite being in the minority at the start line of each of these races, she'll be vying for plenty of hardware nonetheless. "When it comes to racing, Tracey is focused and driven," Riemer said. "Leading up to an event, she makes no bones about it, saying, 'I'm going to go as fast as I can.'"